New or used? When is it worth risking to buy a used printer? When is it more prudent to buy a current model (new, not used)? Should you buy a photo printer new or used? 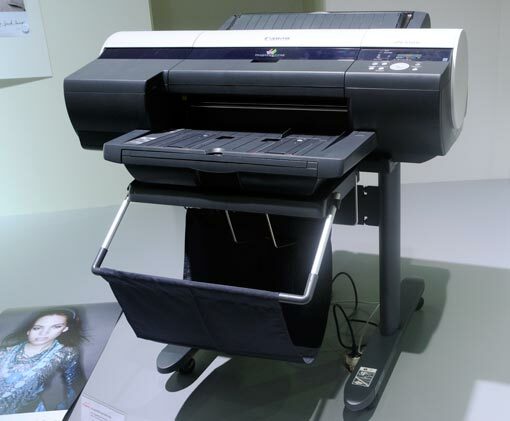 Should you consider HP, Epson Stylus Pro, or only Canon iPF? Our goal is to provide assistance to individual photographers, photo labs, studios, and printshops to decide whether it is essential to concentrate on only new and current models, or is the risk of a used printer worth taking? This project (to provide the answers) will take us several more weeks to write up the suggestions. If you are in a hurry and seek tips now, you can ask for consultation, or if you prefer not to spend a penny on consultation, we suggest you contact a printer resource who knows Canon iPF, Epson Stylus Pro, and HP Designjet printers for many years, (877) 727-7682 or info@ParrotColor.com. Ask for John Lorusso, but if he is on another line, there are plenty of other capable individuals there with years of experience in photo printers for fine art giclee as well as for photo exhibits. If you are looking for a used printer, here is a helpful list. You can’t go very far if you don’t know which printers are available used. 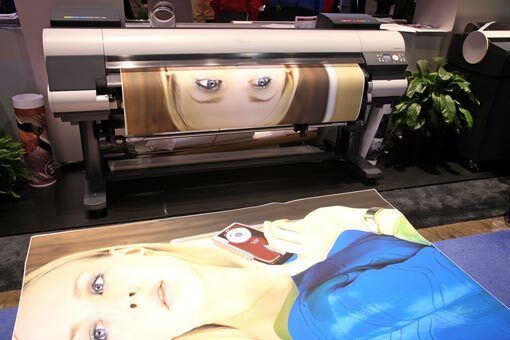 Printers in bold face are current printers during Spring 2012. 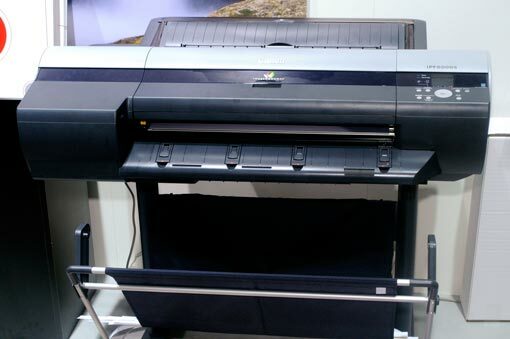 Selex SG-950 (Canon inherited their printer technology from Selex). Printers on the Canon Inc. list for July 14, 2011 are highlighted . A major focus of the ensuing comparison will be to ask, and tabulate, what the new models offer that the old ones do not. 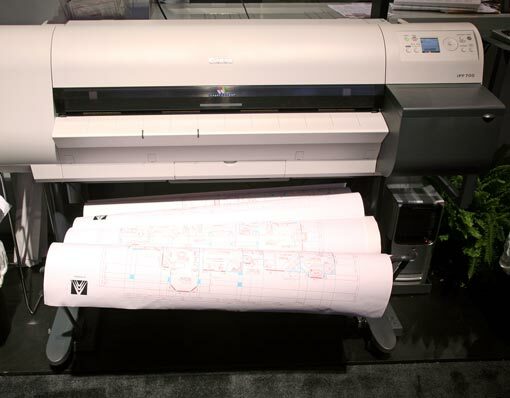 Tips on how to decide whether to consider Canon iPF, or Epson Stylus Pro, or HP Designjet? Some companies will only consider a Canon or an HP. 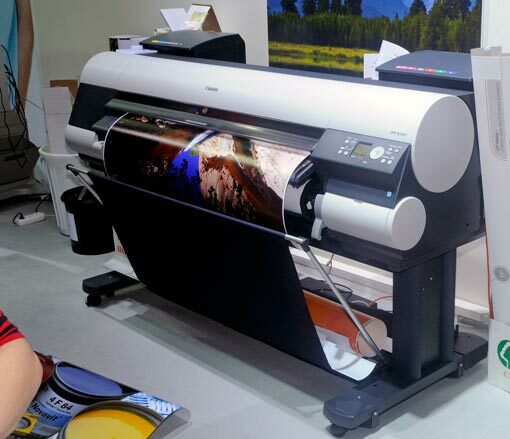 Some giclee ateliers use only Epson, as they believe the name Epson is synonymous with fine art giclee (yet when I visited the giclee atelier of the artist who invented the world giclee back in the 1990's, guess which printer brands be was using? IT WAS NOT EPSON. Yet we at FLAAR have been content with many aspects of our Epson. We have over fourteen years experience with HP Designjet printers, have evaluated many many models from the earliest HP photo printer to the most recent HP Z3200. So we have plenty of experience with which to assist you. For Canon we know the pleasant folks at Canon USA as well as Canon Europe (specifically Germany). I have used many Canon printers and I know fine art photography and giclee ateliers who utilize Canon printers (and have given up on the other brands). Plus although we use Nikon and Hasselblad+Phase One digital cameras, our primary digital camera is a 21 megapixel Canon EOS-1Ds Mark III. So we have experience with the full range of Canon digital imaging products. In other words, you can find someone, somewhere, who likes Canon; others who much prefer HP, and many who will only consider an Epson. Since we are an evaluation institute we have experience with all three. So if you fill out the Survey-Inquiry form, and indicate what you are looking for in a printer, what you wish to print: photos or CAD, fine art or indoor signage, POP or wallpaper. Once we know what direction you wish to go, we have more ability to point you in the right direction. Naturally we know the situation best for the USA and countries who tend to buy their printers in North America and have them shipped to their own country (such as in the Caribbean and some Latin American countries).